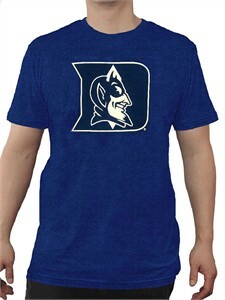 Show your collegiate pride on College game day or anywhere you want in this Duke Blue Devils Men's Crossover Move Short Sleeve T Shirt from E5 an Officially Licensed NCAA Supplier. Constructed from 7.5 oz. 80/20 Cotton/Polyester Material that should give you seasons of wear this Slimmer-Fit t shirt which hits at the mid-bicep instead of down to the elbow also offers a more flattering look to the mid-section. Made in Royal this shirt features a front screened team graphic, short sleeves, a tagless collar, and a crew neck.